White coat syndrome is when you get freaked out at the doctor and your blood pressure / pulse go up. I have it, and at least one of my siblings does too. Kind of funny, given that we come from a family of physicians. Although at home my resting pulse is about 60, at the doctor it’s more like 80 beats per minute. Actually, true story: Once when I was in college, I went to student health for a problem that was freaking me out. My bp was so high when they measured it (I don’t know what it was, they didn’t tell me), that the nurse huffed and said she that if I didn’t calm down, she was going to check it again in ten minutes. I told her that threatening me wasn’t going to make it better. Apparently what happened, as near as I can piece together, is that at some point someone decided that the appropriate number wasn’t 120/80, it was “under 120” and “under 90.” So a ton of people who once had perfectly normal blood pressure are no “pre-hypertensive.” Basically the goal posts got moved. Or else the person who programmed the computer to append the pre-hypertensive warning used “>= 120” rather than “>120” as the firing criteria. Interestingly, I had two appointments last week. At the first, my bp was 120/80. After seeing that warning, I decided not to add salt to my food until the next appointment and see if that changed anything. My second appointment was where I got 120/60. I also hadn’t had any coffee that morning; wonder if that made any difference. 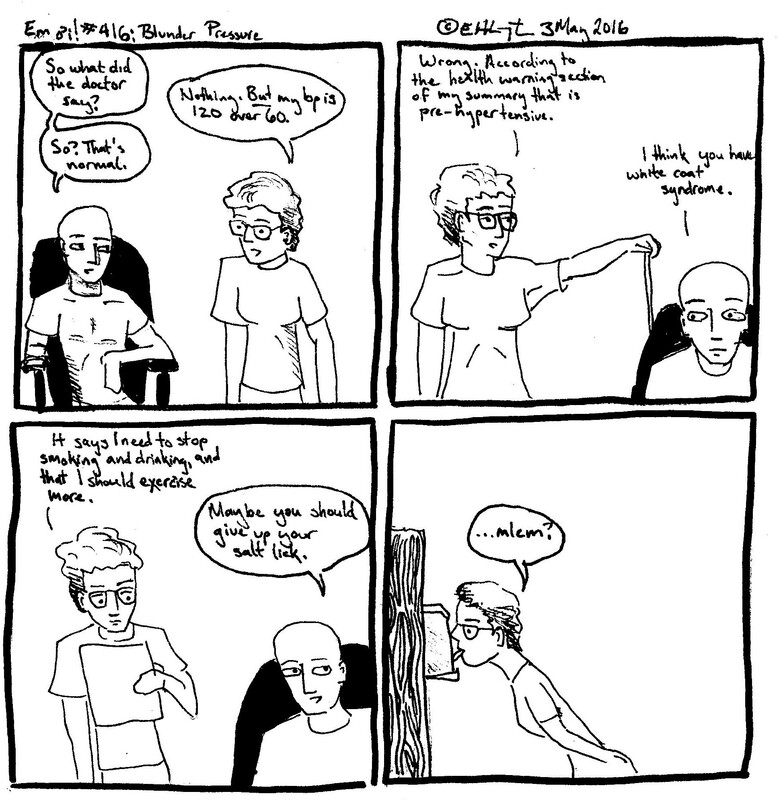 Anyway here is a comic about the dangers of setting up automatic triggers in your EHR. You’re welcome. File this under RC685.H8 L86 2016, for Internal medicine–Specialties of internal medicine–Diseases of the circulatory (cardiovascular) system–Diseases of the heart–Individual diseases of the heart, A-Z–Hypertension.